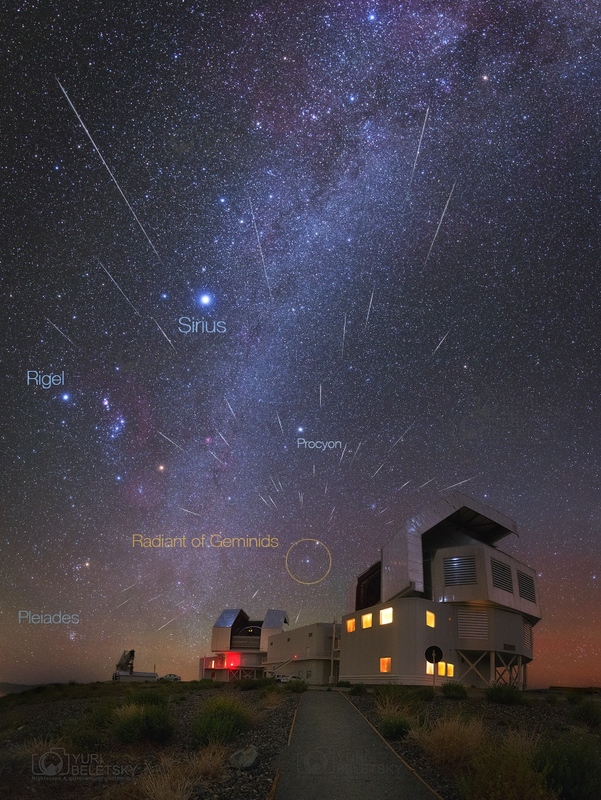 Explanation: Earth's annual Geminid meteor shower did not disappoint, peaking before dawn on December 14 as our fair planet plowed through dust from active asteroid 3200 Phaethon. Captured in this southern hemisphere nightscape the meteors stream away from the shower's radiant in Gemini. To create the image, many individual frames recording meteor streaks were taken over period of 5 hours. In the final composite they were selected and registered against the starry sky above the twin 6.5 metre Magellan telescopes of Carnegie Las Campanas Observatory in Chile. Rigel in Orion, and Sirius shine brightly as the Milky Way stretches toward the zenith. Near Castor and Pollux the twin stars of Gemini, the meteor shower's radiant is low, close to the horizon. The radiant effect is due to perspective as the parallel meteor tracks appear to converge in the distance. Gemini's meteors enter Earth's atmosphere traveling at about 22 kilometres per second.